Study media’s past. Then create its future. Study at the crossroads of theory and practice. Our interdisciplinary program in media, culture, and the arts (MCA) gives your passions a directed focus and artistic outlet. Whether you want to direct films or produce music, you can study the arts with our talented practitioner-faculty while you immerse yourself in your own creative work. Your professors will guide your learning through hands-on assignments and written scholarship in the study of media — in their historical, economic, social, and political contexts, and on personal, local, national, and global scales. Join us and dive into the histories and theories behind various media forms, while creating bold new work that reflects innovative pathways in the medium of your choice. Why Study Media, Culture, and the Arts at Clark? Explore contemporary hybrid and emerging forms such as digital film scoring, virtual reality, video essays, podcasting, and microbudget social documentary. 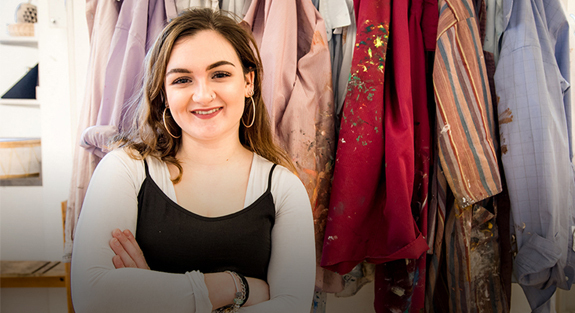 Create and collaborate in the wider context of Clark’s Visual and Performing Arts Department (V&PA), a tight-knit community that includes students majoring in art history; media, culture and the arts; music; screen studies; studio art; and theater arts. Benefit from a multidisciplinary focus, and learn from professors in the departments of English; Language, Literature, and Culture; Psychology; Sociology; and Visual and Performing Arts, among others. Alli Jutras ’19 started off at Clark, transferred to art school — but then returned to Clark after realizing she didn’t want to sacrifice her love for English, science, and history by pursuing art alone. Clark’s major in media, culture, and the arts has allowed her to combine her interests as both a visual artist and a creative writer. My artwork has evolved from drawing and painting to exploring other media. I’m watching my skills grow and develop, as well, in the media, culture and the arts program. And I can’t wait to see where it takes me. MCA defines media as artworks and forms of mass communication, including pre-electronic analog through digital forms. The program’s courses address performance, broadcast, installations, print (from literature to journalism), design (2D, 3D, graphic), photography, film and video production, theater, music and sound, visual fine arts, and all “new” and developing manifestations of media. As a student in the media, culture and the arts major, you will take courses that familiarize you with a range of cultural theories and historical approaches to media production, which are relevant to the functioning of media in a diverse and globalizing cultural environment. You also take a range of courses in media production. The option of double-majoring with art history, music, screen studies, studio art or theatre arts is determined by each program. The Patricia M. Plamondon Award is given to juniors and seniors who have demonstrated their talent in and commitment to the arts and for whom the award will serve to enhance their studies, research, or project-related travel. The award is made annually by a vote of the full-time faculty of the Department of Visual and Performing Arts. Traina Center for the Arts, a renovated 19th-century Romanesque Revival building, contains studios for design, painting, drawing, and printmaking; the Schiltkamp Gallery for student and professional exhibits; a darkroom for analog photography; the Fuller Multimedia Center, with digital editing equipment; and the Fuller Resource Library. The attached 194-seat Razzo Hall is used regularly for recitals, screenings, lectures, and other programs. Estabrook Hall contains music rehearsal space, a recording studio, and practice rooms. At Clark, your education extends beyond the classroom. LEEP Center advisers can help you choose from a range of opportunities that complement your coursework and put your media, culture, and the arts knowledge into practice. You are encouraged to take advantage of internship opportunities during the academic year or over the summer to connect what you’re learning with professional development. In the summer after your junior year, you might be eligible for the Sara Bickman Music and Arts Summer Internship for Undergraduates, which provides financial support for summer internships for undergraduates majoring in the Visual and Performing Arts. Clark is committed to action-based learning, which means as an undergraduate you can join faculty and graduate students in their research and creative work. Media, culture, and the arts faculty include specialists in the history and theory of media, as well as media makers and practitioners. Clark’s annual Fall Fest and Academic Spree Day are opportunities to share your research or creative work with the Clark community while you hone your presentation skills. Investigate a conceptual approach to acting theory and its application while gaining a greater understanding of script analysis, characterization and style, as well as the relationship between actor and audience. Join an international network of performers exploring the relationship between philosophy and performance. Attend weekly Friday morning seminars, and devote the afternoons to developing new work in the studio. Through exercises and applied problems, you’ll explore the language, process, and potential of graphic design as a powerful form of communication, while you make use of both analog and digital technologies. Use various analytical approaches to examine the implications of television as a form of social communication, and develop an understanding of the ideological and structural dynamics that constitute popular culture. Experience how sounds and music work with (and against) moving images while you explore elements of narrative sound and audiovisual analysis, postproduction techniques, and historical sound and music conventions. Explore how music professionals and other artists can support and generate social change. You’ll work with at-risk youths in a free, local music program, and/or intern with a prominent local arts organization. 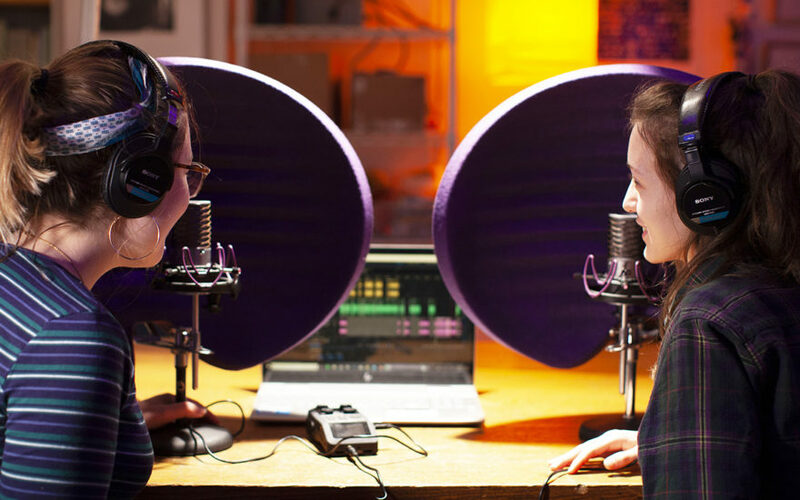 Explore sound recording as a process and an art — along with the science and technology behind it — while creating a multitrack recording. Then, write a short composition, and use software to process and edit it. In this field trip-rich course, you’ll learn how buildings shape our sense of community and citizenship, and apply historical concepts of architecture and civic ideology to the built environment around Worcester. Travel back to examine the great urban and religious centers of the ancient Mediterranean world and the peoples that nurtured them. Explore the concept of ‘city,’ their design, and factors affecting town planning. Explore shifts in global (and local) emerging technologies, and how they’re redefining global communications. You’ll take special note of internet technologies and their impact on youth action and social change. Master the stylistic and technical requirements of radio reporting, editing, producing, and broadcasting while reporting on the surrounding Worcester community and working with college and professional stations. Analyze the elements of effective nonfiction storytelling, and explore the realities and decisions faced by documentary filmmakers. Then, create your own short documentary on a contemporary social or cultural issue.